Dungeons and Dragons is an adventure into your imagination, but it can be much more than that in The University of Lethbridge main stage production of Qui Nguyen’s “She Kills Monsters,” which runs Nov. 6-10 in the University Theatre. 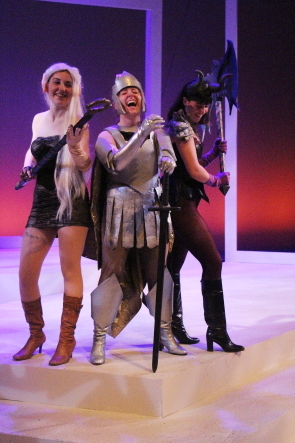 “It’s the story of an older sister who bonds with her younger sister through playing Dungeons & Dragons,” said director Lindsay Zess, who graduated from the University of Lethbridge in 2007 and returned to direct the play, in part because she has a personal subject matter. The play is described as a comedic romp into the world of fantasy role-playing games,“She Kills Monsters” is the story of Agnes Evans as she leaves her childhood home in Ohio following the death of her teenage sister, Tilly. When Agnes finds Tilly's Dungeons & Dragons notebook, however, she stumbles into a journey of discovery and action-packed adventure in the imaginary world that was Tilly's refuge. “It’s really personal story to me because I played D & D to get closer to my brother when he got sick,” Zess said, adding you don’t have to know anything about Dungeons and Dragons to enjoy the story. So she leaped at the chance to direct the play. The 10 member cast have been rehearsing the play since Oct, 1, but have been learning fight choreography since September. ‘There is a lot of choreography,” said Katie Boyes, who plays Tilly and a Paladin in the play. “She’s a human girl who plays Dungeons & Dragons. He can do magic and heal and a fighter,” she said. Some of the cast members got involved with the project as part of a course requirement, other joined because it sounded like a lot of fun ti do. “It sounded like a lot of fun to do,” Boyes said. Rachel Cucheron is enjoying playing the demon Lillith. “She’s very fiery, but she’s also really protective and dangerous. She cares about Tilley very much,” she described, noting she was playing Dungeons and Dragons before she got involved in the play. Kayla Turnbull, who plays Kaliope has enjoyed the fight training portion of the show. “ I’ve loved learning how to use a quarter staff without actually hurting anybody,” Turnbull said. “I’m a baton twirler and this is a lot bigger. So that has been a lot of fun,” she said. “The costume is really hot,” noted Shaye Lyons, who plays one of several different monsters attacking Lilly. “It’s been really fun. I play five or six monsters. It’s inspired me,” she said. Cucheron has also become inspired. “I’m a little more aloof in real life than Lillith. I hope to be more a lot more caring like Lillith is,” she added. “I hope audiences will come out and see people from a different perspective,” Zess said. 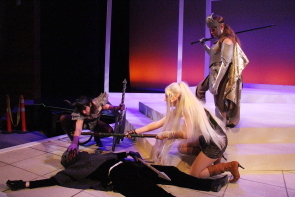 She Kills Monsters runs in University Theatre at 7:30 p.m., Nov. 6-10. Tickets cost $18, $13 for seniors and alumni and $12 for students. Tickets are available online (ulethbridge.ca/tickets) and at the University Box Office (403) 329-2616 | Monday - Friday | 12:30 p.m. - 3:30 p.m.